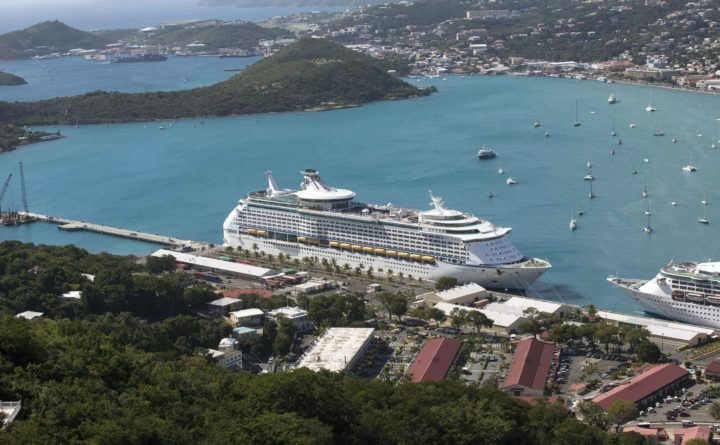 In this Jan. 26, 2014 file photo, the Royal Caribbean International's Explorer of the Seas is docked at Charlotte Amalie Harbor in St. Thomas, U. S. Virgin Islands. A record 30 million people visited the Caribbean in 2017 despite two devastating hurricanes that hit the region. Officials say some islands saw double-digit growth while others saw a nearly 20 percent drop in visitors after hurricanes Irma and Maria hit in September. Contractors tasked with rebuilding thousands of hurricane-damaged houses in the U.S. Virgin Islands have not been paid for months, exposing a rift over how to pay the bills in a territory facing a severe cash shortage. About 10,000 damaged homes in the islands are slated for repair through the Sheltering and Temporary Essential Power (STEP) program, for which the federal government has set aside $186 million. The territory has asked the Federal Emergency Management Agency to expedite release of those funds, because it can’t afford to pay the contractors upfront. FEMA has refused, citing procedures for the program. Typically, state and territorial governments pay the upfront costs associated with such assistance programs, and FEMA reimburses them. AECOM, the main contractor overseeing the housing repair program, said it has “not received payment for work performed,” so it has not paid its subcontractors. “We are working closely with the Virgin Islands Housing Finance Authority and FEMA to have the project funds released so that the project’s subcontractors may be paid as soon as possible,” the company said in a statement. The U.S. Virgin Islands suffered catastrophic damage after back-to-back blows from hurricanes Irma and Maria last fall. The storms damaged or destroyed about 18,500 homes and businesses on the three major islands — St. Thomas, St. Croix and St. John — including multiple high-rise apartment buildings. The Virgin Islands has a population of about 103,000 people. Even before the hurricanes, the Virgin Islands government was facing a dire financial crisis because of its stagnant economy. Those financial woes deepened after the storm because of the collapse of the tourism industry and shrinking tax revenue. The territory has accumulated about $1.9 billion in debt, and it maintains only two to four days of cash on hand, according to Lonnie Soury, spokesman for the Virgin Islands Public Financing Authority. He noted that the Virgin Islands has received other aid from the federal government, including $196 million to shore up its general fund and utilities, he said. In total, the federal government has allocated more than $2 billion for the territory’s disaster recovery. In recent weeks, Virgin Islands Gov. Kenneth Mapp, I, has made personal appeals to FEMA Administrator William “Brock” Long to release more of those funds. Ricardo Zuniga, a FEMA spokesman, said the territory asked in May to begin drawing down the $186 million for the STEP program — also known in the Virgin Islands as the Emergency Home Repairs Program — but FEMA’s Office of Legal Affairs raised concerns about some costs. Zuniga said the agency will authorize release of the funds only after receiving “appropriate documentation” of the project’s scope and costs. FEMA officials stationed in the Virgin Islands are working with colleagues in Washington to resolve the matter, he said. However, that funding can be used only for construction costs, such as labor and materials to repair homes. The territory government has requested an additional $153 million for non-construction costs, such as logistical support and a call center for storm victims to apply for aid. Zuniga said FEMA officials in Washington are reviewing that request, but he did not know how long the review process would take. If contractors are not being paid, Zuniga said, that is up to the territorial government to rectify. FEMA’s only obligation, he said, is to make sure the territory is adequately reimbursed for incurred costs. Rob Ord, a security contractor on the STEP project, said he is planning to lay off some workers because of the delayed payments. “I don’t care about blame, just pay so we can keep working,” said Ord, president of Virginia-based Falken Industries. In addition to providing security at job sites, Ord is tasked with making security badges for the project. In recent days, he said, other contractors have told him they laid off workers because of nonpayment. “Because they had not yet received payment, it has affected their business model,” said Gair, who served as New York’s recovery officer after Hurricane Sandy. When a worker is laid off, it slows the recovery, simultaneously delaying reconstruction while also taking dollars out of the local economy, Ord noted. He said that his employees, most of whom are Virgin Islanders, make between $20 and $30 per hour.